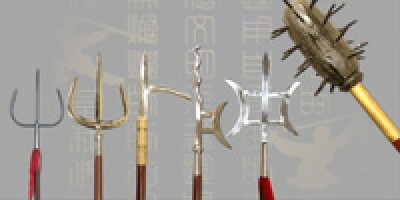 The Hook Spear is one variation on one of the most famous weapons in Chinese martial arts. The head ..
Forked long weapons were very popular among Chinese martial artists, and the Southern Bull Head Fork..
Forked long weapons were very popular among Chinese martial artists, and the Traditional Inward Fork..
Forked long weapons were very popular among Chinese martial artists, and the Z Fly Fork is one varia.. This Snake Halberd is one variation of halberd type weapons. Halberds were commonly used as both inf.. The Traditional Tang is one variation on one of the most famous weapons in Chinese martial arts, the.. This Traditional Halberd is one of the classic weapons of Chinese martial arts. Halberds were common.. Specially designed with 2 pieces and easily carry around when traveling or training. By purchasing t..
No other weapon looks as brutal and intimidating as the Wolf Teeth Mace. Also called wolf tooth club..
Forked long weapons were very popular among Chinese martial artists, and the Southern Fork is one va..
Forked long weapons were very popular among Chinese martial artists, and the River Fork is one varia.. This Southern Tiger Fork is lightweight and is specially designed with 2 pieces and comes with a car..